Keith Sonnier, Ba-O-Ba VI, 1970. Ba-O-Ba Series. Foam rubber, neon tubes, transformer, wiring, 69 1/2 x 152 x 144 inches. Courtesy of the Artist and Haeusler Contemporary Munich/Zurich © Haeusler Contemporary Munich/Zurich. Photo: Wolfgang Stahl . LONDON.- The Whitechapel Gallery presents an exhibition of rare early works by the American sculptor Keith Sonnier (b.1941) on view for the first time in the UK this summer. Making three-dimensional drawings with neon, Sonnier bathes spaces in the luminescence of coloured light. Using industrial or everyday materials Sonnier and his contemporaries including Lynda Benglis, Mary Heilmann, Eva Hesse, Bruce Nauman, and Richard Serra produced art works that demonstrated the quality of the materials used, and often presented these sculptures in dialogue with both the space in which they were shown and with the human body. Four major early neon works made between 1968 and 1970 transform the 19th-century architecture of the Gallery. The brightly coloured works in shades of red, orange, green, blue and violet infuse the Gallery with light and colour. Dot Dash Corner (1979) explores architectural space, in this case the corner of the gallery, and uses the language of Morse code where letters are translated into dots and dashes. On show alongside this, Neon Wrapping Incandescent (1969) features looping neon tubes wrapping around two incandescent bulbs, their black wires dangling to the floor. Against another wall in the gallery space, Lit Circle Red with Flutex (1968) is a circular sculpture of patterned glass, partially encircled by a clear tube filled with red neon gas. The fourth work on display, Ba-O-Ba VI (1970), is part of Sonniers series of the same name which he started in the late 1960s and has continued to work on throughout his career. Based on the Greek mathematical theory of the Golden Ratio, Sonnier combines circles and squares with geometric shapes such as aluminium bars and neon tubing. For this work, foam mattresses slump against the wall and on to the floor, and are framed by multi-coloured neons. The title derives from Haitian French dialect in Louisiana for bath of colour or light bath and refers to the effects of the rays of light against skin. Keith Sonnier (b. 1941, Mamou, Louisiana) radically reinvented sculpture in the late 1960s. After graduating with a B.A. from the University of Southwestern Louisiana, Lafayette in 1963, he went on to receive an M.F.A. from Rutgers University in 1966. Sonnier came to prominence through his participation in several groundbreaking group exhibitions: Eccentric Abstraction (1966), curated by Lucy Lippard at Fischbach Gallery, New York; Anti-Illusion: Procedures/Materials (1969), curated by Marcia Tucker and James Monte at the Whitney Museum of American Art, New York and Live in Your Head. When Attitudes Become Form (1969), curated by Harald Szeemann at the Bern Kunsthalle. He has had numerous solo museum exhibitions, including at the Stedelijk van Abbemuseum, Eindhoven (1970); The Museum of Modern Art, New York (1971); Centre Georges Pompidou, Paris (1979); The Hara Museum of Contemporary Art, Tokyo (1984); Hirshhorn Museum and Sculpture Garden, Washington, D.C. (1989); Sprengel Museum, Hannover, Germany, Switzerland (1993). His recent exhibitions include Keith Sonnier: Light Works (2015) at the Musée dArt Moderne et Art Contemporain, Nice and Keith Sonnier: Early Neon (2015) at the Hall Art Foundation in Vermont. Sonnier has received more than 20 major commissions of his architectural neon installations in public spaces and his work can be found in dozens of public collections in Europe, Japan and the United States. 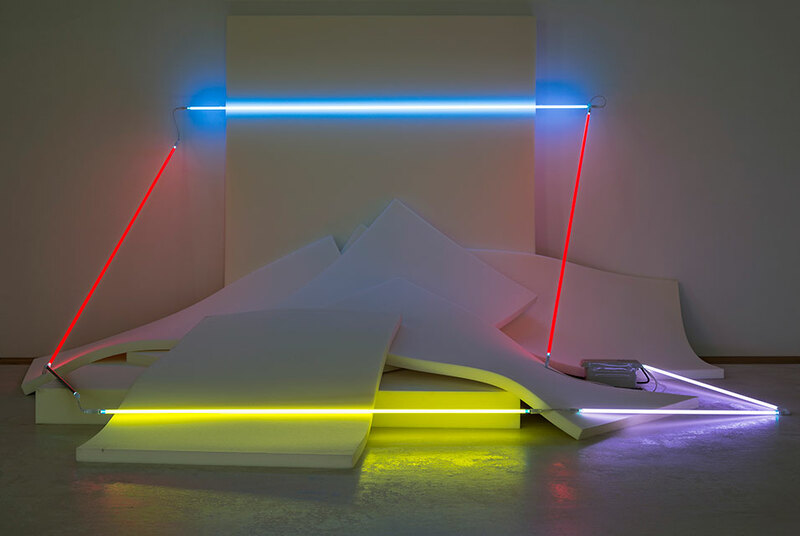 Keith Sonnier: Light Works is curated by Lydia Yee, Chief Curator, Whitechapel Gallery with Habda Rashid, Assistant Curator, Whitechapel Gallery.